Learning and developing these defensive driving skills for correctly changing lanes will go a long way towards ensuring you remain safe and accident-free on the roads. Scan the road ahead and plan in advance. Before changing lanes, scanning the road ahead and checking what other drivers are doing is vitally important. Things to watch out for include pedestrians about to step on to the road, other vehicles reducing speed, and drivers about to merge across your lane. Keeping an eye on the brake lights of vehicles in front of you is also a good indicator of trouble ahead. Cars beginning to slow down will usually hit their brakes giving a vital warning to alert drivers behind. Monitor the rear vision mirror. The rearview mirror gives a much wider view than the one provided by your side mirrors. The rearview mirror should be checked with a quick glance, simultaneously keeping your main focus on the road ahead. Things to watch out for when glancing in your rearview mirror include traffic coming up faster than you are driving. Also keep your eyes peeled for vehicles signaling to change lanes behind you who might be increasing speed to pass your vehicle. Communicating with other drivers is the most important part of defensive driving. Signaling is done to communicate to other drivers what you are about to do. By signaling to other drivers, you give them the chance to slow down and allow your lane change to be made safely. For example, drivers in front of you who are planning a maneuver may stay put if they see your signal. It always wise to remember that people often make unexpected moves. Don’t take anything for granted and get into the habit of anticipating the worst! Don’t forget your blind spot. Turn your head and take a quick glance over your shoulder to ensure there is no other driver in the lane beside you. If you do see a vehicle there, stay in your own lane until the vehicle has gone past. Recheck ahead…. (again) before changing lanes. Immediately before turning the steering wheel to navigate your lane change, check once again to make sure no driver is slowing down or straying into your path. Move gradually into your lane change with only a slight adjustment of the steering wheel. 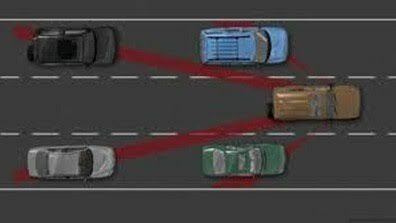 If it is not possible to change lanes when you check the blind spot, cancel the maneuver and prepare to begin all over again. Don’t change lanes at intersections. Make sure you plan your lane changes both before and after intersections where side roads, streets or crossroads meet the road you are using. 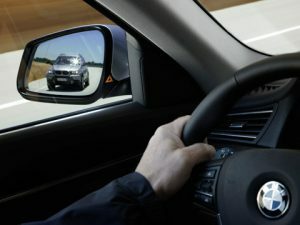 When it comes to defensive driving, lane change techniques and signaling correctly are important skills to learn and implement into your daily driving. Make sure these are skills YOU learn and become familiar with; your life may depend on it! These are your BLIND SPOTS!